Australia, Brisbane – October 5, 2016 – The creators of Fruit Ninja are bringing the best of retro arcade action to mobile with Dan the Man, a beat-’em-up platformer that delivers epic story, frantic combat and challenging gameplay on iOS, Android and Amazon devices. Dan the Man is a continuation of the hit YouTube series by Studio JOHO, a show which took the internet by storm when it first debuted back in 2010. What began as a simple Super Mario parody quickly evolved into something much greater, spawning an entire web series and racking up millions of views along the way. Now, seven webisodes later, Dan finds himself at the centre of a deadly conflict which threatens to consume his village, livelihood, and one true love: a fierce resistance fighter named Josie who was recently imprisoned by a nefarious organisation. In the face of insurmountable odds, players must guide Dan as he fights his way through an army of neckless goons, shadowy figures and colossal bosses in a campaign spanning 12 intense missions. Doing so will require keen reflexes, solid platforming skills, and knowledge of the game’s intricate upgrade tree, a system designed with both touchscreens and gamepads in mind. Coins collected during gameplay can be used to bolster Dan’s extensive arsenal which incorporates flying kicks, stinging punches and bone-crunching body slams in addition to deadly weapons such as machine guns, rocket launchers, and razor-sharp throwing stars. Those looking for an even greater test will find it in the form of three additional game modes: Battle Mode, Survival Mode and Weekly Events. Each one provides a formidable challenge, but successful warriors will be handsomely rewarded with coins, power-ups and custom costume pieces containing unique modifiers. Combatants looking to flip the script can even play through each mode, campaign included, as either Josie or Barry Steakfries, best known for his high-flying antics in Jetpack Joyride. Combined with the game’s striking pixel art, retro soundtrack, secret areas, and meticulous platforming segments, Dan the Man is a game which pays tribute to the past while continuing to bridge the gap between consoles and handheld devices. 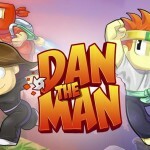 Dan the Man is available on the App Store, Google Play and Amazon Appstore as a free download with optional in-app purchases. Halfbrick is a professional game development studio based in Brisbane, Australia. Founded in 2001, it has developed many popular games across mobile and digital platforms including Fruit Ninja (iOS and Android), Jetpack Joyride (iOS, Android, PlayStation 4) and Fish Out of Water (iOS and Android). For further information, please visit halfbrick.com and follow on Twitter, YouTube orFacebook.